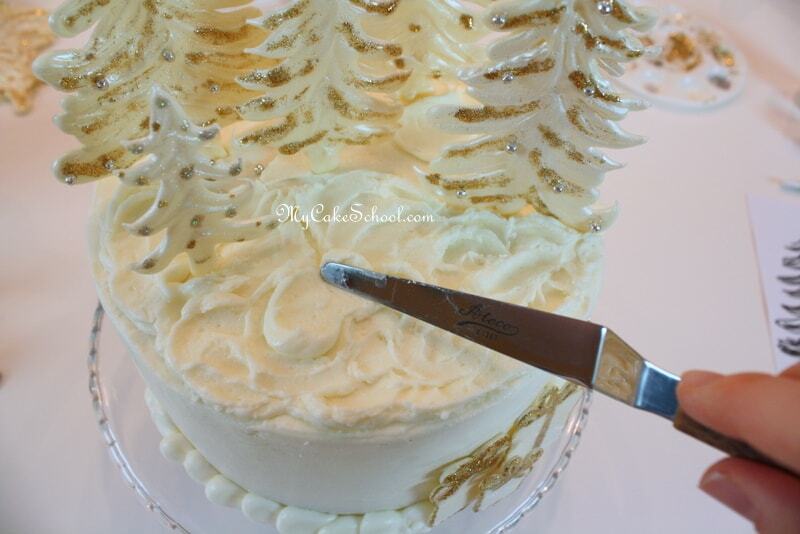 Today I’m going to share a gorgeous Winter Wonderland Cake of White Chocolate Trees! This surprisingly simple cake tutorial has been one of our most popular for Christmas and winter gatherings! One of my favorite decorating mediums for creative accents is candy coating (aka candy melts, compound chocolate, chocolate bark, etc.). There is no tempering required–just microwave, pipe your designs, pop in the fridge or freezer to speed set, and you’re done! 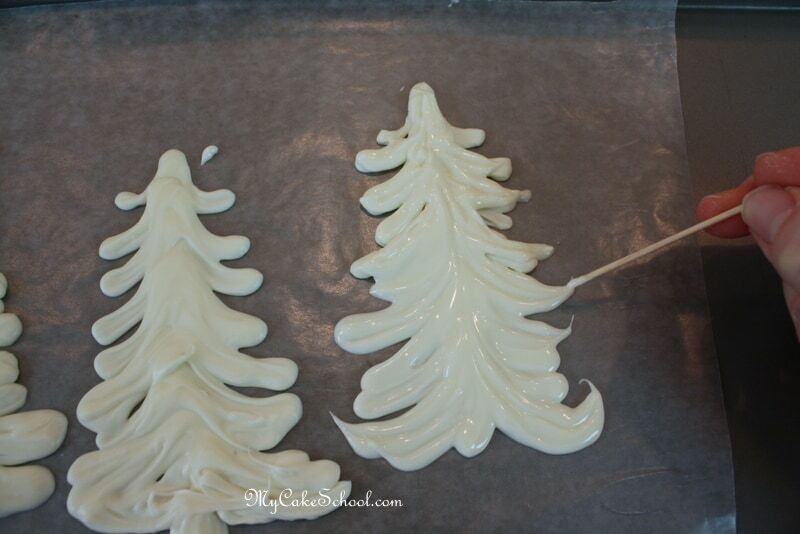 Let me show you how I made some beautiful Christmas trees today. This design is also perfect for “winter wonderland” themes all through the season. “Glue” My glue was light corn syrup today, but I also like basic tylose glue (aka sugar glue), or piping gel. 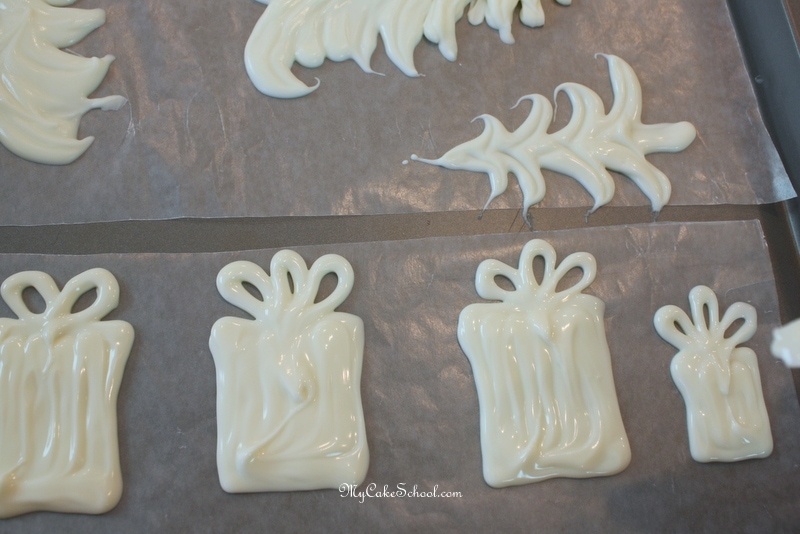 First, I melted my white chocolate candy coating in the microwave. 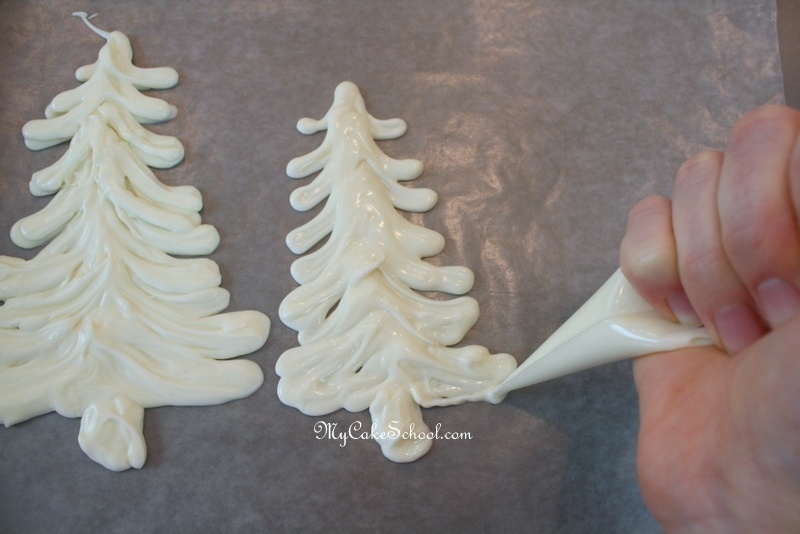 Then, I filled a disposable piping bag with the “chocolate”, snipped the end, and began piping Christmas tree shapes in various sizes. I like to freehand but if you’d prefer to use a template, you can slide one beneath the waxed paper and trace. **Make sure to pipe your trees fairly thick. Mine are pretty lumpy and bumpy. If they are thin, they will break more easily. Some of my tree branches have a rounded look, but for others, I used a toothpick to drag out the tips of the branches into a point. I piped some presents too! Then, into the freezer–the whole tray, for about 10 mintues. Once firm, they’re ready for the next step. Fresh from the freezer! 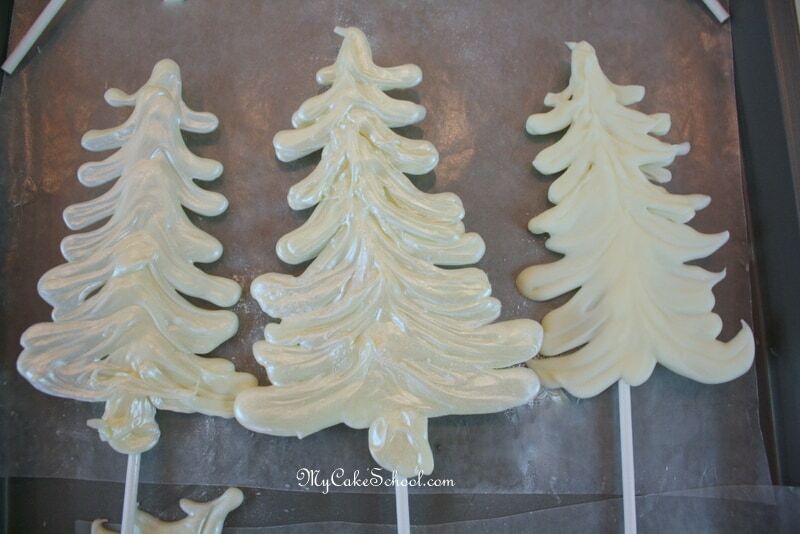 I flipped over my chilled trees and attached lollipop sticks to the back with melted chocolate (piped on). I flipped them because I wanted the textured, bumpy side to be in front. If you prefer the smooth side, no need to flip! 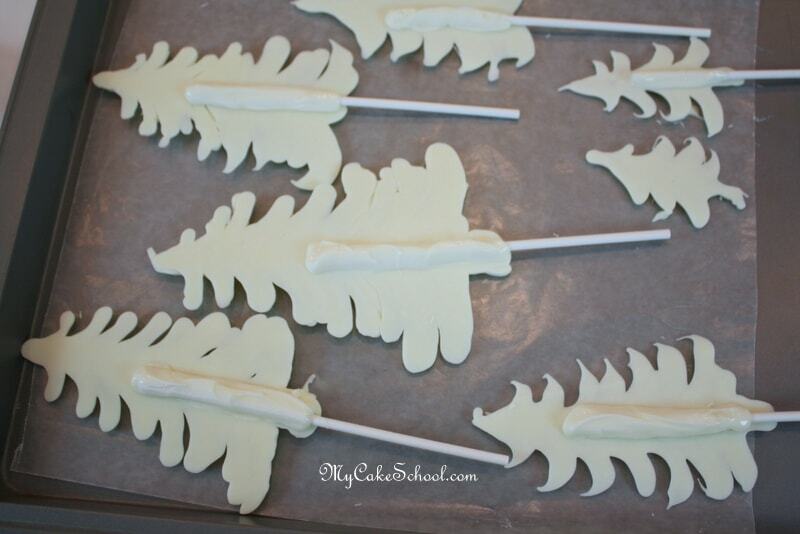 These candy stick anchors will allow our trees to stand nice and tall with no worries tilting or breaking. Once everything is nice and chilled, you can safely pick up your trees! I love pearlizing. 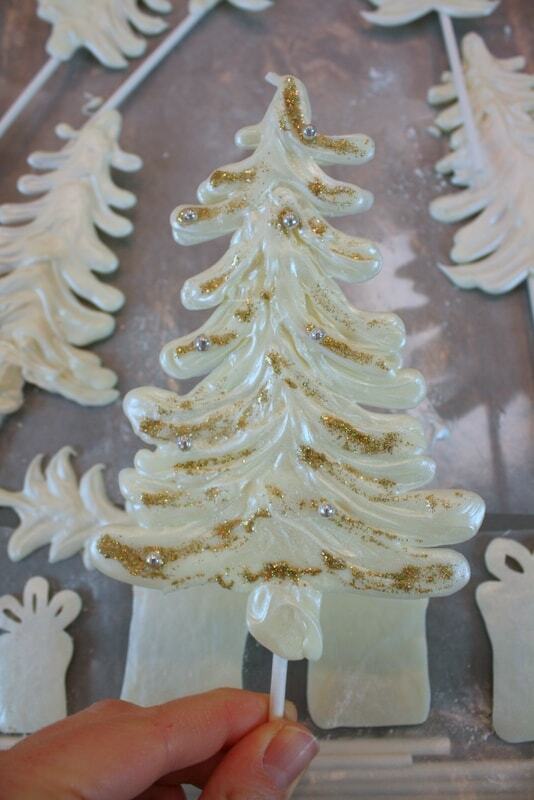 I experimented with Wilton Pearl Spray for the first tree below, and brushed dry Super Pearl dust for the middle tree. You can see that they look very similar… the pearl dust may be ever so slightly more shimmery. The last tree is naked for now. What a difference! Next, sparkle time. Here, I have both Gold & Silver Hologram Twinkle Dust. 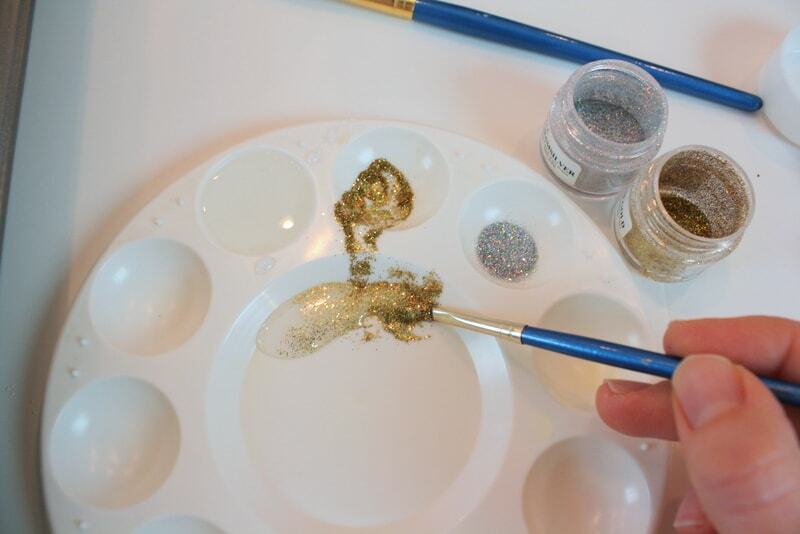 I experimented with mixing a little light corn syrup right into the gold dust. This allowed me to paint on the glitter only where I wanted to. The corn syrup took several minutes–probably a good 15 minutes or so to dry. If I had mixed in a little vodka, it would have dried more quickly. It’s fun to experiment though. 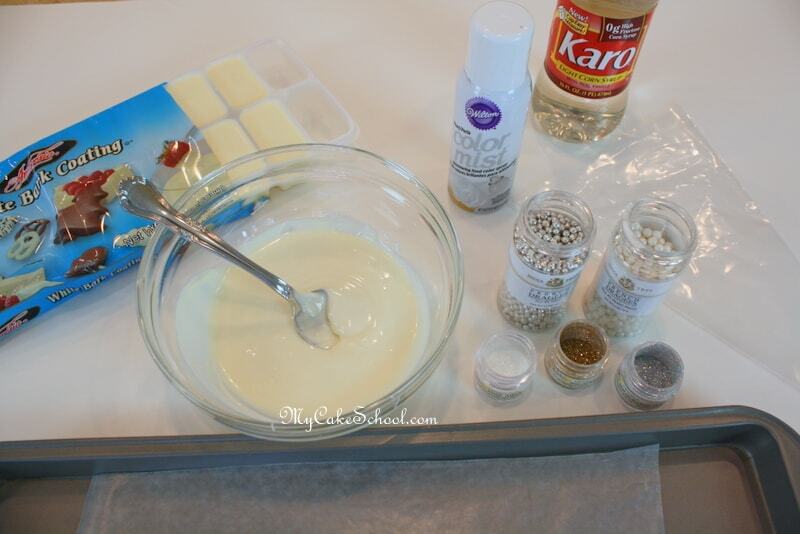 Piping gel would have worked well too–and so would “sugar glue”. I love the sparkle! I added some silver dragees. I pressed them into the light corn syrup “paint” I had just brushed on, but sugar glue or piping gel would dry a little more quickly. You know what would have been even better? To have dropped on my dragees just after piping the chocolate trees, before the chocolate had a chance to set. Next time, that’s what I’ll do. I LOVED this part. I could have decorated trees all afternoon. I decorated the presents using the same method (only I wanted the smooth side of the gifts to be the front). These would be fine to leave at room temperature or a cool place in your house until you need them. I still like to pop the cookie sheet with decorations into the freezer for just a few minutes before placing the decorations onto the cake. 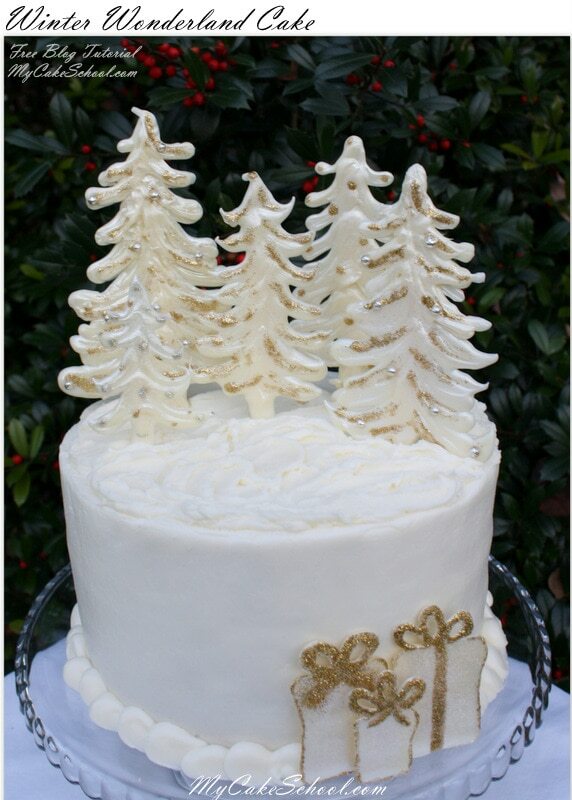 I placed the trees into our 8″ round cake which was frosted with vanilla buttercream. I attached the presents to the front side of the cake with a little buttercream. The snowy bottom border was piped from a Wilton tip 12 (medium round tip), in no particular pattern. The frosting on top was applied with just a swirly motion of the spatula. Thanks for stopping by, I hope you learned something new! 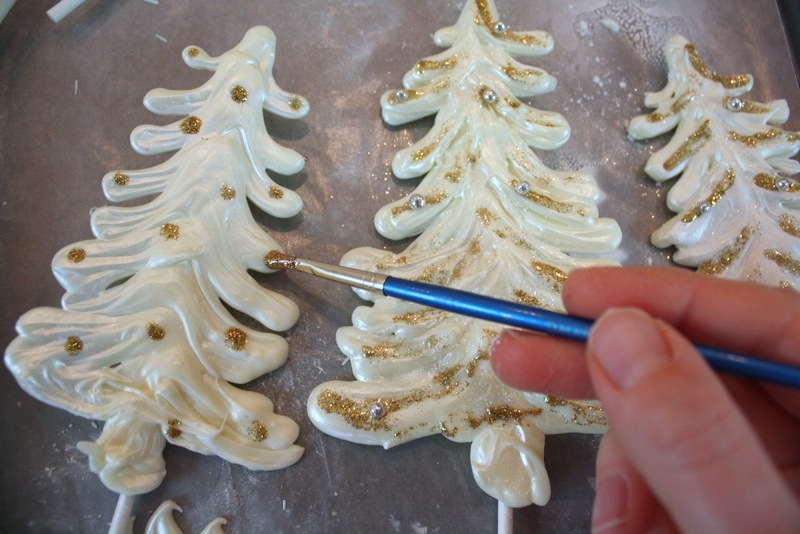 If you’ve never tried working with candy coating for decorations, this is the perfect time to start. Have fun with with it! It would be so easy to use the same method but with much more color–you could even use green candy coating for green trees. Enjoy making winter wonderlands of your own, and I hope you’ll share your creations with us! Make sure to check out our full collection of tried and true frosting and cake recipes in our Recipes Section! 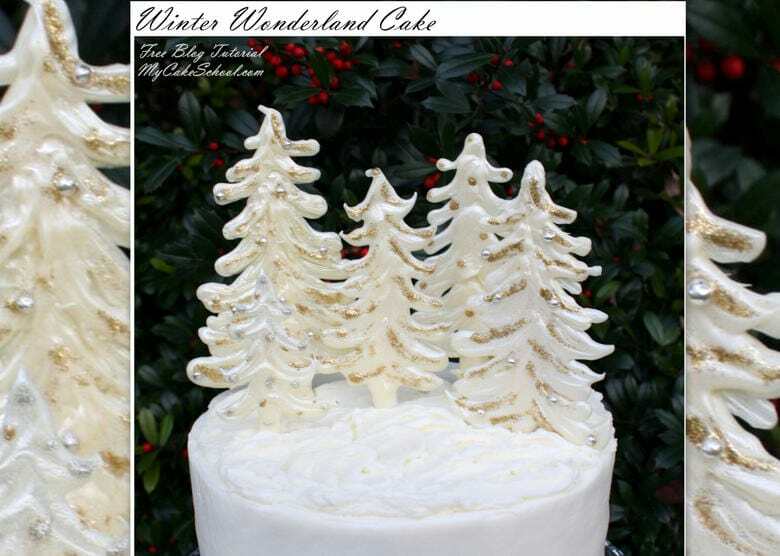 You can find more beautiful cakes and ideas in our Winter and Christmas Roundup of Cakes, Recipes, Tutorials, and Ideas! 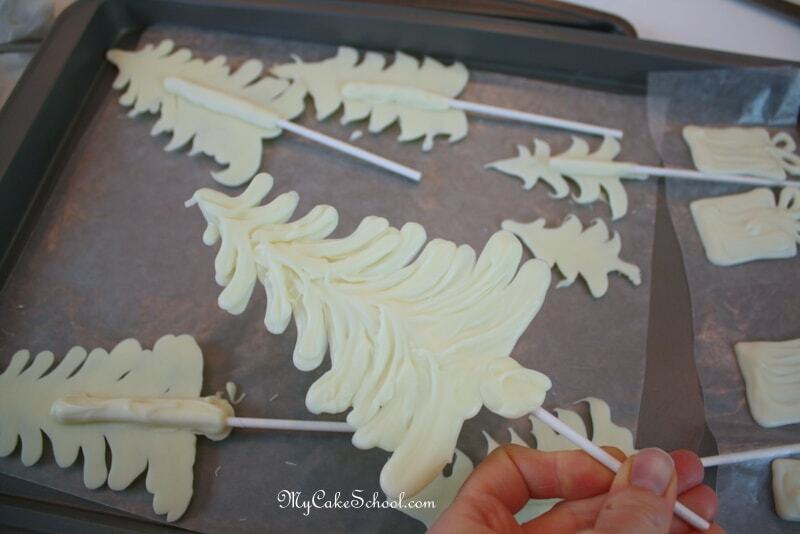 *We create very similar chocolate trees (but green) in our Red Truck Cake Topper-free video tutorial also if you’d like to see a video of this simple process! « How to Make Petit Fours~A Video Tutorial! This was fun and easy to make. Unfortunately I made my presents too large for the cake, so I quickly made some in royal icing and put them on the plate. I made peppermint frosting for the snow and the filling inside of a dark chocolate cake, vanilla buttercream on the outside. It was wonderful, everyone loved it. I’ll post a picture on the member gallery. As usual, thank you! I just finished my trees and even though they aren’t as beautiful as yours, they are so cute! 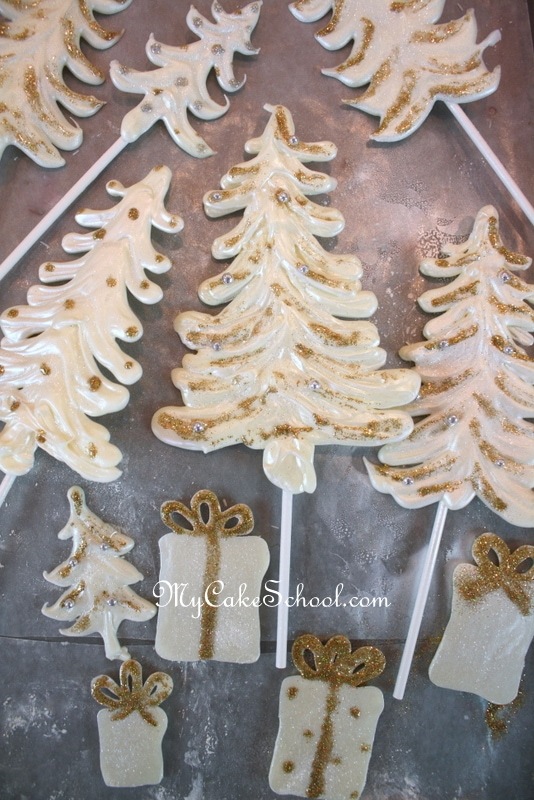 I decorate a buche de noel cake a little different every year and these are perfect to stick in the log.Love your site. All the cakes are terrific. You ladies are good!Thank you and Merry Christmas! Thanks for the tutorial what a fast easy way to decorate a cake. My grandson can make this with me. Just gorgeous, Thank you for the Tutorial of the Xmas trees and also the Xmas truck just amazing I will be trying the truck soon.